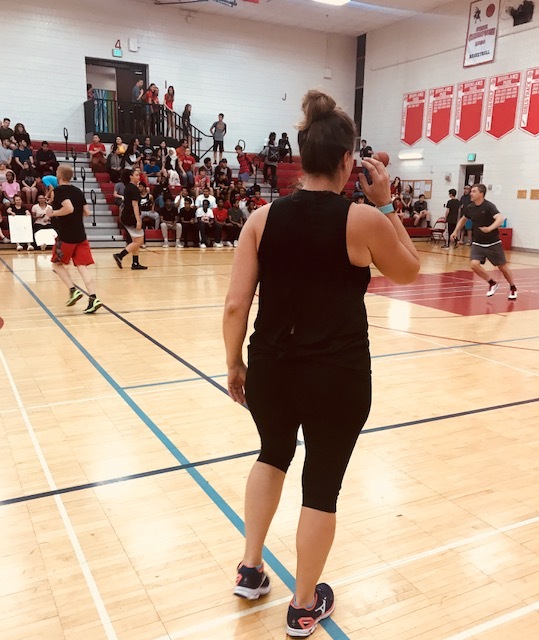 The Senior vs. Staff basketball game took action on Friday, May 18th. This game was a way to keep the seniors and teachers blood flowing as we close off this school year! The game took place during 7th hour & before the game started, the senior side in the stands filled at a rapid rate. The seniors were guaranteed to win the basketball game to show the staff who’s boss and that’s what ended up happening. Highland Park Senior High hosts an event called the Senior vs. Staff basketball game every year. It’s a moment for the students to show the staff who’s in charge and for the staff to show the seniors what they’re made of. With the help of the Senior Class Council, they helped organize the whole game. Each half was 16 minutes. There are a total of six teams with 5 people per team. Every few minutes there would be a rotation so everyone would be able to participate. Since there were rotations, everyone had the opportunity to show what they could do, and to prove that the seniors rule the school. After the first half ended, the Senior Class Council introduced a halftime shooting game that lasted 3 minutes. One team was on the left side of the court while the other was on the right. Each team consisted of six people and the team with the most points at the end of the 3 minutes would win. So, the Senior Class Council took some initiative and picked 6 random people from the stands, and as an audience we all sat back and cheered for everyone. People got some water and were ready to be put back in the game. Some of the things people liked about the game were the different skills some of the players carried. People even admitted that the staff had skills too, and were surprised when some of the seniors were getting crossed. Lunch time is many students’ favorite period of the day. It’s a time where people can be themselves while nibbling on some food. But have you ever wondered who makes the food? Who goes through the stress and time to make these dishes for us? Lunch Ladies! These lovely women go through the struggle to make each and every student food, while getting ready to serve, and then clean, at the end of each wave of students. Not all heroes wear capes. Throughout the day, students get hungry, and no one is happier then when they are getting ready to go to lunch. Lunch is a very chaotic place that is often located in a bigger area of the school. Some kids call it the “place of relief,” while filling their stomachs with their favorite dishes, but others just think of it as lunch time. One of the students’ favorite dishes, that they serve, is called Italian Dunkers. It’s a cheesy-bread type food that is given with a side of Marinara sauce, along with other sides given to the students in the “bar” section. My fellow writers and I thought it would be a good idea to show thanks to our Lunch Ladies at Highland Park Senior High by handing them a big poster saying how much we appreciate them, along with some candy on the side to signify how sweet they are. Everything they do for us is very helpful in ways that isn’t always addressed when necessary. If it weren’t for these ladies, we would be hungry throughout the day and wouldn’t be able to focus as well as we do with food in our system. Lunch Ladies are really helpful, and as students of Highland Park Senior High, we thank you for the work you do to keep us fed and focused. During the basketball season, everyone is getting ready to either play hard or cheer hard, at Highland Park Senior High. 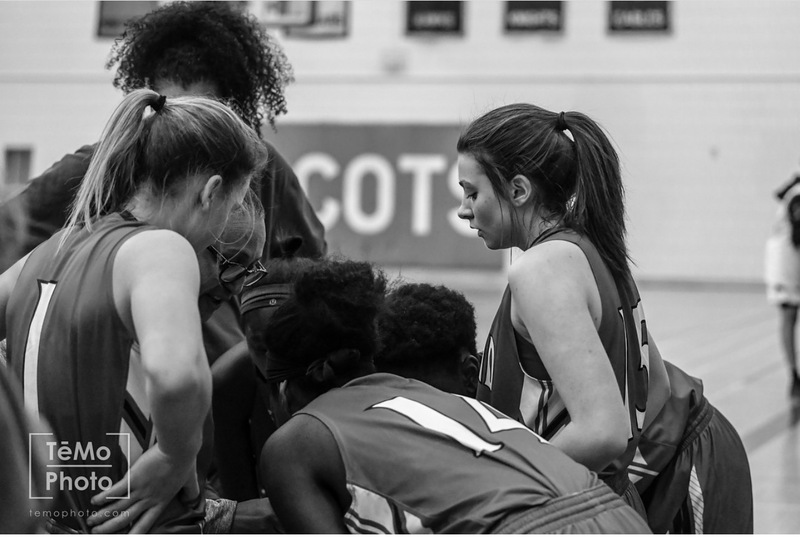 Highland is primarily known for its school spirit, and athletes that show their athletic ability while playing and working hard; not just individually, but especially working as a team. Girls and boys basketball games are often very entertaining to watch. Each and every player, on both teams, has a skill that when put together, makes the team special. One thing that brings down the girls team is the lack of support at the girl’s games because, others would rather watch the boy’s game than women’s for various reasons. Between the months of November and March, basketball season is in session in SPPS schools. The teams work on skills, team building, cardio and other activities to make the team excel. One thing that the girl’s team has noticed, is the lack of support that they get during regular games, or even bigger games. Sometimes it’s because the boys and girls are scheduled on the same day, but other times it’s because it’s perceived that girl’s basketball is “boring, weak, or because the boys are more entertaining” according to a teammate. There are many false things said about the girl’s basketball team and the sexism level is somewhat high. We asked some of the players to hear their opinions on what they think about the sexism between the boy’s and girl’s game. One player said: “I think that the boy’s basketball team does a good job of supporting the girl’s teams…it’s just that the people of the school have such a negative outlook on us sometimes, but I guess they’ll come when they can. I don’t know.” The concern is not with the boy’s team supporting us, it’s mainly about the community not wanting to give support. Overall, the season was great. They worked really hard to make this season successful, and had a long lesson about confidence which showed in the majority of the games. One thing that the Highland Park Girl’s basketball team has is teamwork, and that’s what leads the team to pursue success no matter how hard the season. They overcome any obstacle they face, as long as they have each other. During the school year, teenagers love to be busy, whether it’s with sports, activities, or a job. People who don’t like to be involved in school all the time tend to pick up a job so that they are occupied while earning money. A job comes in handy during high school because it’s a way to earn pocket money and save for college, but for some reason, a certain group of people tend to be more unemployed then the rest. 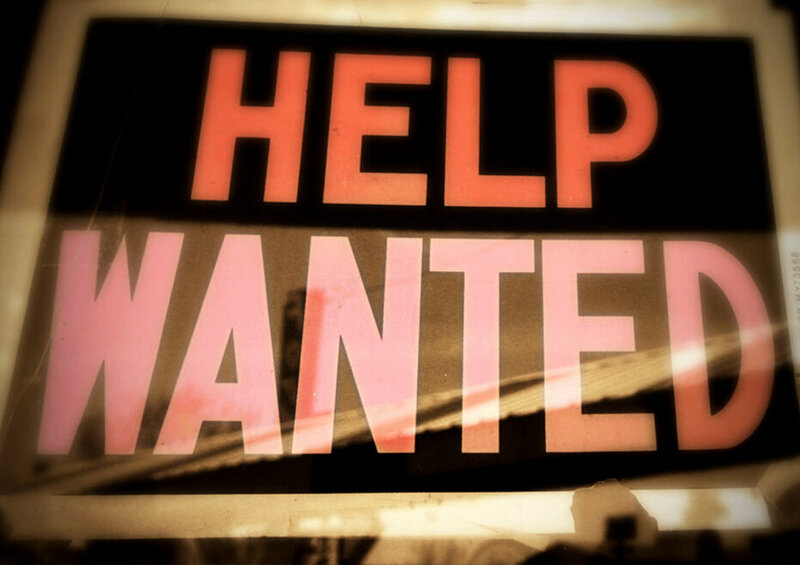 With tons of help wanted signs up, and teens ready to start a job, what’s the problem? It’s a weird thought, because according to the Minnesota Employment and Economic Development, as of November 2017, 10.6% of teenagers are unemployed. They believe that this has to do with the minimum wage increase to $9.50. The Minnesota Employment and Economic Development website says that this percentage is due to employers being more skeptical when hiring new teenage workers. The good part about this, is that the minimum wage has increased the teen participation in the labor force. When you think about it, our employment system is flawed for teens. If all jobs expect previous experience, how do they have the opportunity to get started. Nowadays, it’s hard to find jobs that require little to no previous experience. This leaves teens, who are new to the idea of employment, unemployed. There are also experienced adults who are left with part time jobs that are normally occupied by teens. If these adults can’t find jobs in their designated area, they are left with the part time jobs. This is considered involuntary part time. Even though you might not have a job, there are easier ways to earn money. You could cut a neighbor’s lawn, walk a dog, or even do chores. Getting hired is a hard process and may take a while until you hear something back, but do not give up. Girl Scouts, of River Valley’s, mission statement is “Girl Scouting builds girls of courage, confidence, and character, who make the world a better place.” The Girl Scout dream began in Savannah, Georgia in 1912. Juliette Gordon “Daisy” Low organized the first Girl Scout Troop. From then, she began to break the typical boundaries set on girls at the time. Low, even before desegregation, provided a gateway for young girls to participate in this activity. Low’s dream has been continued for over 100 years building courage, confidence and character. When talking about Girl Scouts, there are six different levels; Daisy, Brownie, Junior, Cadet, Senior and Ambassador, in that order. Each level is determined by the girl’s grade. No matter what the grade, all Girl Scouts have the opportunity to earn badges, travel, sell cookies, go camping and many more activities. Each are an opportunity to prepare the girls, to better themselves for their future, and keep them on track. Each troop varies in size, but it allows each girl to develop into leaders. To this day, Girl Scouts is a 2.6 million strong organization. In our troop, 52589, we are known as Ambassadors. During the year of 2016-2017, we have been trying different activities to earn money for our troop trip to Europe. During this trip, we will be gone for 15 days and we are going to be visiting: France, Switzerland, London, and Spain. The cost is around $4,600 and ways we earn that money is through: selling cookies, volunteering, and setting up events for the younger girl scouts. Cookie sales are around February, but the activities have no certain dates. It’s a great way to get involved and to show our leadership skills through helping the younger girl scouts form into the leaders that they will soon become. Ever since freshman year, we knew that this moment was going to come. The beginning of October is when things get tough for the class of 2018. 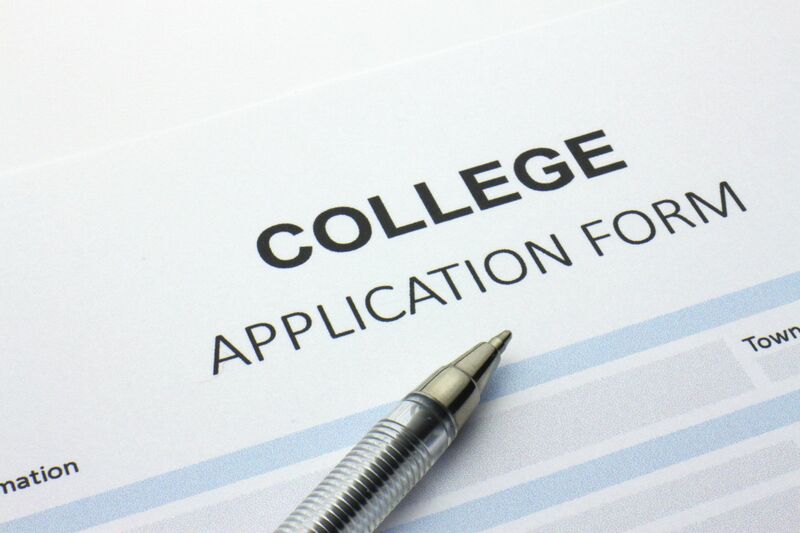 This is the month where seniors apply for colleges all around the country. It is fun, but it is also stressful because the smallest mistake could cost us our opportunity to get into the university that we decide on. We all have dreamed about the colleges we want to attend, to become something; it’s just that the process is the hard part. There are various parts in filling out a college application. Whether it’s dealing with scholarships, to filling out FAFSA, the different parts control different areas. The main source of all applications is called “The Common App.” That app is recommended by a majority of colleges around the country. It helps send out all your information, after you fill out everything it asks for. It asks for things like: your name, date of birth, school, GPA, ACT, essay, etc. Although you might be excited to apply and get accepted, this is very time-consuming, so it’s best if you start a month ahead. During this process, there are a lot of things you need to make sure you have BEFORE you submit your application. You need to make sure you know your class rank, GPA, and have access to your ACT/SAT scores. When you have access to those reports, it can help you fill out the application thoroughly and accurately. 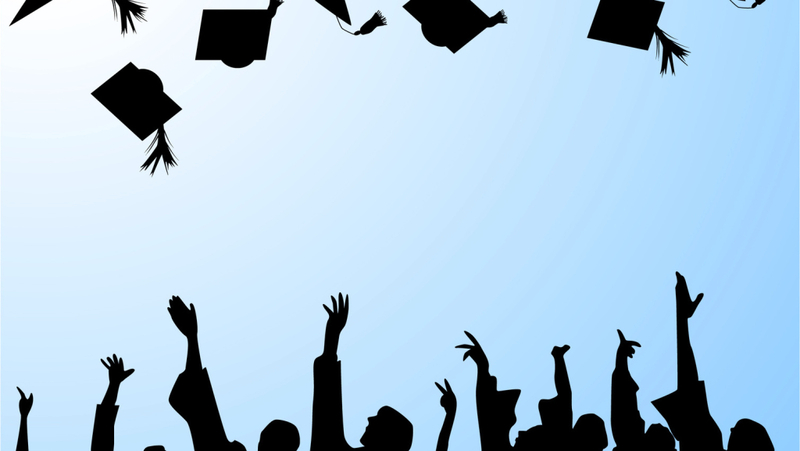 When dealing with FAFSA, make sure you choose your graduation year to the next year. For example: FAFSA 2018-2019 because that is the year you would be entering college. If you mess up, you have to go back into FAFSA, fix the problem, and re-submit it. As mentioned before, it is a very exciting idea getting to go to college and living on your own, meeting new people, and trying new things, but in order to do that, everything needs to be handled correctly before you leave high school. It is most stressful for seniors because this process involves a lot of discussion with your counselor, asking for recommendations from your teachers, and keeping your grades up while being motivated to accomplish all those things in a timely manner. It takes a lot of devotion, time, and concentration. A positive note to all of the class of 2018: do not give up because your dream is just around the corner. Do not let “Senioritis” hit you before you submit all your applications. For classes below (2019, etc), here is some friendly advice from a few seniors: make sure you start looking for colleges early and have some ideas on what you want to major in. It’s best to have an idea on what you want to do early, rather than coming up with something last-minute and struggling. Take some time and brainstorm. You can do anything you put your mind to, just do it. Good luck to all Seniors, and we hope you get into your dream college. As the class of 2018 enters their final year of high school, they have a lot on their minds. Not only do they have to balance out school, jobs, and sports, but they also have to worry about College. The beginning of the 2018 school year means the last time to enjoy their high school careers. Football games, Homecoming, Prom and Boat Dance are just a few of the amazing things to experience at Highland Park Senior High. These are events that we want seniors to look back on and smile. During the first two weeks of senior year, we took the time to go around and ask our new seniors what they thought about their year so far, and what they are looking forward to in the future. Asking these questions gave them more of an idea of what to think about in their future, and what they might want do. What is one thing you’re looking forward to this year? John B: Unaware of the school [John B is new to HPSH this year]. I’m excited about my late start and my early release. Nina C: Going to the dances. Nicole J: Graduating because you can restart everything. You’re not forced to go to school anymore. One thing you’re going to miss about high school? John B: I would say less relationships with people. Everyone knows each other. Nina C: I’m gonna miss not having a lot of responsibility. Rasjus: Just being able to see friends everyday. Maddie R: Seeing my friends. Yohannes A: I guess my friends and sports because I don’t think I’ll see them or play sports in college. Nicole J: The relationships with the teachers and students. What is one thing that has impacted you throughout your high school career? John B: My sudden change in school had a very heavy impact on me. Nina C: One thing that has impacted me is my mental health. Rasjus J: definitely my grades and maintaining them. Procrastination and scheduling them. Maddie R: Volleyball. It gave me motivation. It gave me a reason to be here. Yohannes A: I don’t know, sports. Nicole J: Probably the teachers. The motivation and the way you will be cooked if you miss a few days. John B: Own my own business. I don’t want to work for anybody. Nina C: I think I’ll do something that will benefit myself; hopefully. Rasjus: That’s a weird question. Hope to get a degree and be a journalist. Maddie R: Hopefully studying some sort of science. Marine biology or Geology. Yohannes A: College for two years. Nicole J: Hopefully going to college and being somewhere on my own. I might stay here. Even though this is going to be our last high school year, it has just begun. This is the time to develop friendships, make connections, apply to colleges, try new things, and experience many more things. One thing to keep in mind seniors, is to push through the year hard, and finish the year off good. There will be no better feeling than to walk across the stage, receive our diplomas, and say “We did it”. After a successful season of track and field, there was one night that everyone was waiting for…and that was the Banquet. The Highland Park track team had a variety of people with many different skills. Those skills helped us win track meets, and if we didn’t win we sure put in our all. On May 17, and May 19, the City Conference Track Meet was hosted, which meant “Go hard or go home.” The Highland Park team was determined to make their mark at this meet, and that’s exactly what they did. All the training, and confidence we built as a team, surely helped us get the win for the Conference Champs of 2016. In my eyes, I saw a team that was known for building each other up, not knocking each other down. This year not only helped me improve some skills and help me get into shape, but it helped me face my fears and made me be more confident into trying new things, and to be more open-minded. The skills and things I was taught this year made me realize that I’m stronger than I thought I was, and made me think “outside the box.” Since I had so much faith in the team, and myself, I made my mark on the team. Banquets are usually events that bring people together, celebrating accomplishments, and talking over the greatest moments, followed by speeches that include wise words. Monday, May 6th, was the day of Highland Park’s track banquet which recognized and awarded many of our great athletes. One thing I like about banquets is that it shows the different capabilities in people, whether it’s from jumping, to throwing, and even running. 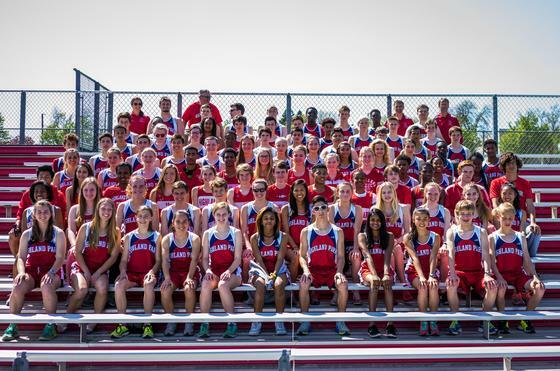 We talked about what the team meant, what was expected from the athletes, and how the overall season went. The coaches had a huge impact on me and the team, because if I wouldn’t have known that there was gonna be obstacles on our way to success, I would have never continued trying to reach my goals, and going outside the box. I achieved blocks, a big part of a race that I havent tried till this year. That connects with the saying “You learn something new every day” – Ray LeBlond. Overall, this year was filled with accomplishments, and not only am I proud of myself, but I am also proud of my teammates. I want to thank the Track and Field coaches for making this track season one to remember, and to continue doing what you think is right. To anyone who wants to join track, or is getting ready for next season…stay true to yourself and know your strengths. Fields of hair is a beauty/barbershop located in St. Paul, on Minnehaha and Hamlin. 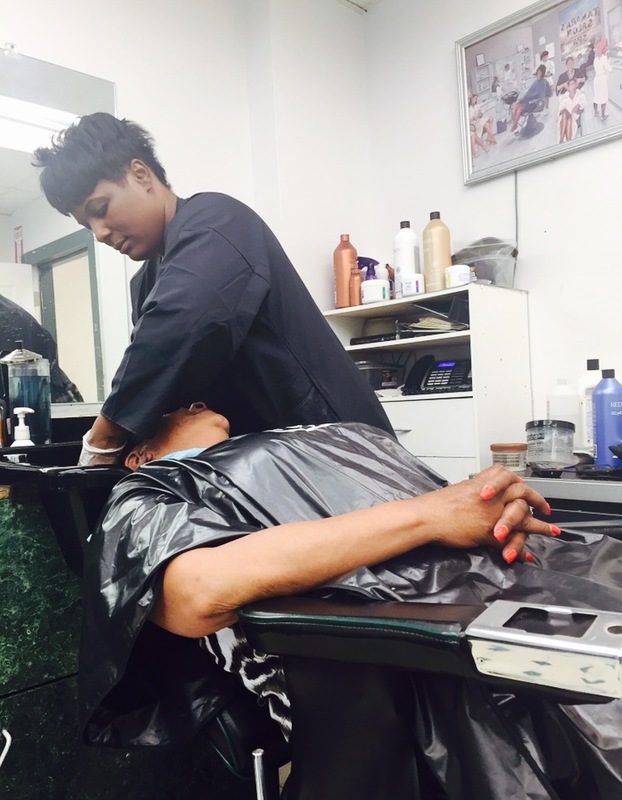 It’s a beauty shop and barbershop combined into one, and was started by a women named Marcie S. Fields. She runs the hairstyle department, and was joined by her loved one. Together, they made a simple building into a succesful shop that they can gladly call their own. What are some business techniques you used to keep the business going? What made you want to start your own hair company? What are some advantages and disadvantages about your company. “Being on time, that’s the biggest thing” says Marcie. She keeps things in order and keeps her appointments and calls in order. Another answer from Marci about what techniques she uses to keep the business going is: “You have to be able to be dependent on time. Customer service skills are important especially making your customers happy. Customer service skills, make your clients happy which falls under the category “customer service skills”. When the customer lets you know what they want, that’s when the listening comes in. You need to get a visualization on what they want and you can’t get that if you’re not listening.” Her response about the customers relates to the saying “The customer is always right”. One thing she cherishes the most about her shop and how she started her company is the freedom, which to her means that anyone is welcome. Being my own person makes the moments stronger. Spending time with my family matters the most, so I can make my own schedule when I work and when I don’t. No paid vacation since I set my own schedules. If you don’t work, you don’t eat. My experience at Field Of Hair was nothing but sensational, positive, and well-mannered. The service was great, and the job was finished in a matter of time. I feel as though she listens and focuses on what the customer wants. 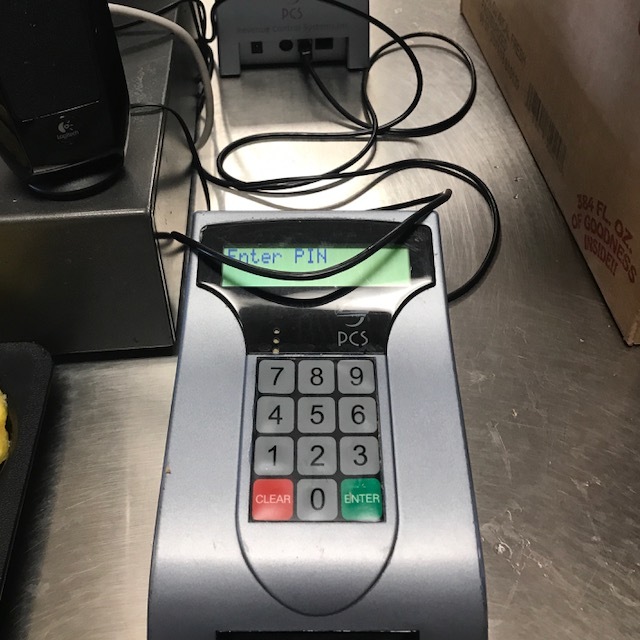 She keeps things flowing, and gets people in and out with no hassle. I am satisfied every time I walk in there, and I hope to continue visiting such a pleasant shop. Have you ever wondered why people run for fun? What the significance of track is? Track is what you make of it. Track and field is a combination of field events such as throwing, jumping, and running: which goes from 50m hurdles – 3600m. Unlike other sports, track is simply a sport that helps you get in shape, and helps you improve skills. Whether it’s from throwing a short distance, to jumping farther than you ever jumped! It’s a matter of commitment and hard work. If you’re not going to put your all into what you do, then it reflects in your races and events. Track is important to me because it’s very intriguing and lively. Since 5th grade, it has been my favorite sport. It can be quite overwhelming sometimes when you over think about the little things, but you have to keep moving. My past coaches have told me key things that I have kept with me until this day. “Don’t let the little things knock you down. Sometimes you fall, and when you do you get back up”-Anonymous. Sometimes when you feel like giving up, it’s better to just think about what you think is the problem, and try to fix it. Giving up won’t make you better, it will only slow you down even more. Everyone has their own skills, and it takes specific training and strength to bring the talent out of their shell. Each event is not the same, which means more people can try to search what they like best about each one. Being open-minded in a sport like track is good because depending on what sport you play, there is always a better option that you can partake in. Another key thing with track is setting goals. Some may call it “PR” which stands for personal record. Whether it’s improving a second or a minute, you want to set that up for yourself so not only can you better yourself, but you’re pushing yourself closer to success. I suggest more people join track no matter what school they go to, because it helps with getting stuff off your mind, improving skills, and getting you fit for your next season, if you play multiple sports. 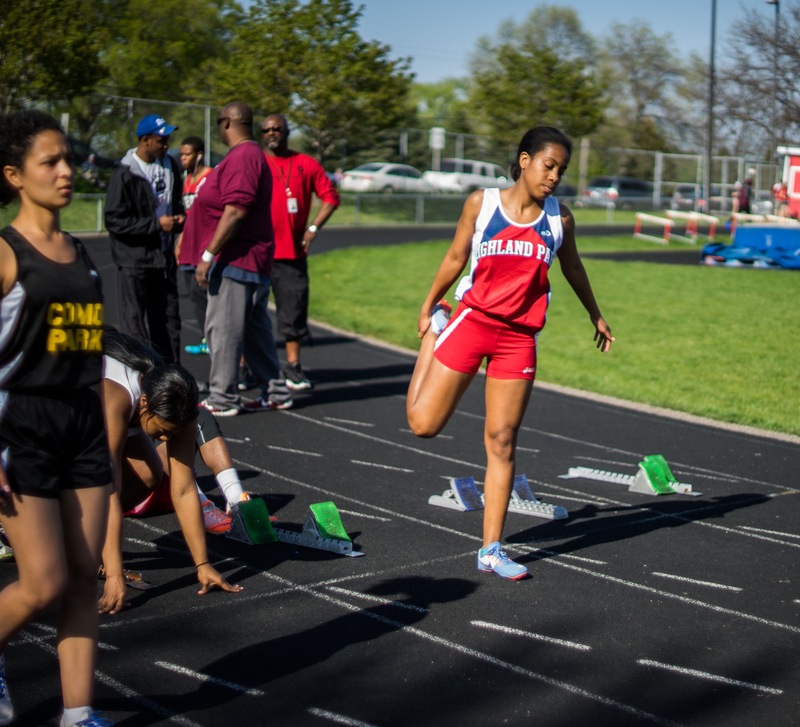 Track and field is for anyone, any age, and is here not only to make you better, but also to help you build a better perspective on skills and exercises.